Our latest product launch sees the arrival of the 8ft (2400mm) LED Caparo. The original fluorescent T12 batten was available in 2ft up to 8ft, however it was phased out in 2012 in accordance with new EU environmental legislation. 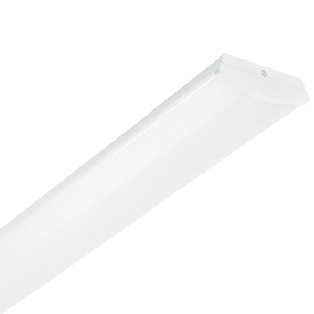 Although there are T5 and LED alternatives on the market, they have never been available in 8ft. The release of the 8ft LED Caparo has a number of advantages over 2ft-5ft alternatives. When installing shorter luminaires, a greater number are required to generate the same lux levels. Instead, by installing 8ft fittings, the customer reaps the benefits of increased lumens per watt, excellent uniformity, a lower purchase price and lower installation costs. Designed and manufactured in the UK, the Caparo’s metal work is of high grade powder coated Zintec steel coupled with a high output cloud polycarbonate lens. The patent pending lens delivers maximum output whilst eliminating glare and spotting associated with LED. Furthermore, there are two types of end cap that are offered: snap on or a tamper-resistant screw on. The new 8ft Caparo is available with emergency options and is compatible with our intelligent light management systems i.e. occupancy sensing controls – MIC 1, MIC 2, MIC 3. It is available in analogue or digital dimming options. The luminaire has domestically sourced components and is manufactured solely within the UK.